UPDATED | One Nation will have two seats in the NSW upper house but former senator David Leyonhjelm has missed out – despite being so confident of securing a spot he’d changed his Twitter profile to read “now NSW MLC for the Liberal Democrats”. 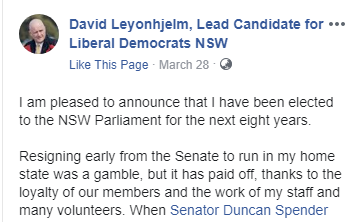 Shortly after the final preferences were distributed today, Leyonhjelm had to alter his bio once again, so it now simply states he’s a “former senator”. The two One Nation upper house MPs will join a mixed bag of crossbenchers who’ll hold the balance of power in the state’s Legislative Council. The last available seat went to One Nation candidate Rod Roberts who’s a former detective from Goulburn. Roberts will join former federal Labor leader and NSW One Nation leader Mark Latham at Macquarie Street when parliament resumes in May. The second last seat was won by Animal Justice Party candidate Emma Hurst who’s a former PETA media officer. In March, Leyonhjelm declared he had been successful in his bid to move from federal to state politics.